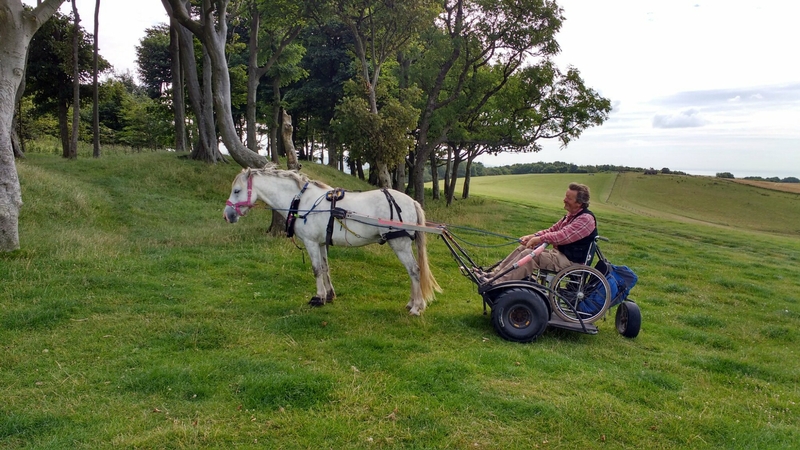 Pony Axe S has made all terrain access a reality for people who use wheelchairs, and has created the first SAFE equestrian activity. Easy really. If a vehicle is dangerous with an animal attached, releasing the animal makes it safe. Five years of taking people with the full spectrum of disabilities across all types of terrain show that the Pony Axe S system works. My insurers and Kingston University Engineering Department who checked out the safety of the entire system, can confirm these facts. This video shows the standard equestrian safety system, praying nothing goes wrong, and having no solution when things do go wrong. Pony Axe S beleives in safety, and in our risk assessments we discuss “bolting”. We know it can happen. You can see from the Canadian video how catastrophic bolting could be. And how unstoppable bolting horses are. If they can go through a park bench like that, what difference does a pair of reins make? Can you imagine what would have happened to anyone sitting on the bench? I use the Canadian video as an example because it happened this week. It was pure luck that no person was badly injured or killed and no horses were injured or killed. The system in England is no better. People and horses are maimed and die because traditional horse powered vehicles have no safety systems. Traditional horse organisations ignore the obvious risks of horses bolting with vehicles attached, because they have never tried to find a solution. Tradition and safety don’t mix. Safety is the product of caring about safety, and believing it matters, and being prepared to change everything to achieve a safe result. Pony Axe S cares about safety. That is why we are safe. And that is why we can make the countryside accessible, so anybody, in any wheelchair, can go anywhere.